Sorting out what to display at the upcoming Suite E Life Drawing Group exhibit at Place des Arts and came across this little sketch of Caitlyn. The group will be exhibiting paintings and drawings but we will also be showing a few sketches from our life drawing sessions. Luckily I kept a few as often they end up in the trash quickly after the sessions. 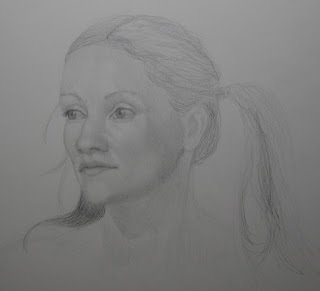 This sketch is roughly 11x14" and may be on display at the show.....still sorting through images. Looking forward to the Opening Reception on Friday Jan 8 from 7-9pm at Place des Arts. Hope to see you there!